Having recently finished Misfortune Cookie which I enjoyed I was so excited when I was asked to read the next book in the series The Twelve Days to Christmas. 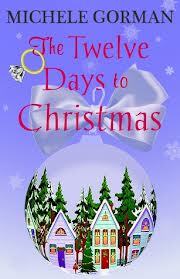 I am a huge fan of Christmas so I was looking forward to meeting our characters again but with a festive feel. "What if his proposal had an expiration date?" Hannah’s in a bit of a pickle. In twelve days she flies from Hong Kong to the US with Sam, where he’s finally going to meet her parents… and ask to marry her. Since overcoming a rather rocky patch in their relationship (which was totally his fault), he really is a new man, and they’re completely in love. The problem is, she feels panicky every time she contemplates matrimony. Which is perfectly normal, isn't it? She has no idea but she’s got to find out before he pops the question... because she’s not 100% sure she’s going to say yes which will make for a very uncomfortable family holiday. He’s got to ask her before they go. I flew through this book which is easily done at a mere 83 Kindle pages. I found it easy to fall into step with the characters as I feel as though they are friends having got to know them so well in the previous book. I was hoping for a more festive feel to the book but I always hope for all the trimmings when any books either have Christmas in the title or a festive scene on the front page so that is just me getting over enthusiastic! It was great to follow up on Hannah’s story to see what happens next and I feel it was a great way to read this in a short story. Once again we see Hannah’s roller-coaster romance taking familiar steps and leaves the reader wondering will they, won’t they? I couldn't predict how this book was going to end so I was quite surprised by the ending. I do feel like you need to have read the previous book to understand and enjoy this book although the author does refer to past events to jolt your memory a little but having the familiarity to the characters helps to fall into the storyline and with it only being a short book you don't have time to get to know the characters. This is well worth buying on kindle if you have read Misfortune Cookie just to be able to catch up with the characters one last time.